On a non-stick pan, on medium heat, add onion and cook for 3-5 minutes, then put in a large bowl. Make sure you spread them evenly in a bowl so that way onions won’t be cooked from the heat. Before start mixing all the cooked ingredients, put a cotton glove first, then plastic glove on top so your hand doesn’t get burn! Be sure to use a wok that is made for stir frying. Making japchae in a wok that is made for stir fry is much better than using cheaper thin woks that stick to everything. Cast Iron works the best and is ideal for making fried rice as well. When you cook a japchae you want wok that will not stick to the starch in the noodles. 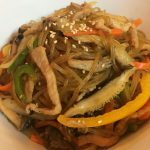 A cast iron surface is ideal for making japchae. With a cast iron wok your japchae wont stick to the wok after proper seasoning. This may take awhile for you wok to become properly seasoned, and japchae make stick or cake on you cast iron in the beginning. But once you have seasoned the wok it wont stick to your japchae. Its important to know that with cast iron you don’t want to use regular dish soap. Rather use salt to clean your cast iron, and fresh water. After washing put on the stove and heat the cast iron until dry, coat with vegetable oil and store it away. This way your cast iron wont rust and will be ready for the next time you cook. Cast iron provides cooks with superior heat retention to prepare asian recipes. Sturdy base and consistent source of heat helps keep the wok stationary on the stove top. To make Japchae (Stir Fried Glass Noodles), start by preparing your ingredients placing them near the stove where you can work each step. Make sure you season beef for a better taste. If you don’t have spinach, you can use a green bell pepper, however, I prefer spinach for the taste. Once your assembly line is ready, then follow the instructions below.